Working Together: Let's place comments on our Blogs! Many of us spend our time in the future. We are thinking about whether we are going to get that raise, or find the right partner to share our lives with, or having enough money to pay our bills, and so on and so forth. The list gets longer and longer. We are so set in the future we don't see the possibilities available to us now. You can't be in two places at the same time? Thanks to a scheduling snafu, I'm hosted today by two generous and talented ladies of crime--Kaye George and Maggie King. on their small, well-heeled feet. poses with ease and flexibility. Poem: Can I Love… What God Sees in Me? Game Board : Model III , The Longitudinal Star Gate 14 Model. Book Title : Advance 3-D Chess : The Longitudinal Star Gate 14 : A Synergistic Modulation Synopsis of Vector Logistics. Book Title : Advance Chess : A Pre-Dawn to the Age of Superlative Bionic Robotic Intelligence Capabilities. 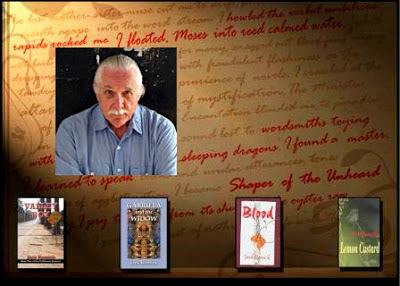 Join Marsha Casper Cook on September 20 at 9PM EST 8 PM CST 7 PMMT 6 PM PST when she welcomes Award winning Author and Poet Jack Remick. I find many things in life to be inspiring. Something as small as a feather gliding right before your eyes. Especially on a day when everything that can and does go wrong happens. Then God sends that one gliding feather to say, “It’s okay” and in that moment life is well. Even when it physically has not changed. Somehow you know it is going to be alright. Cooking with my family, especially my daughters. I drive an 18 wheeler tractor coast-to-coast. No. I hope to be, one day.